The number one ranked Lancers (12-0) would punch their ticket to their second consecutive 6A state championship game last Friday with a double overtime win over previously undefeated and number two ranked, Olathe North (36-35), by going for two in the second overtime in one of the states best games in 2014. "They were loading the box up. 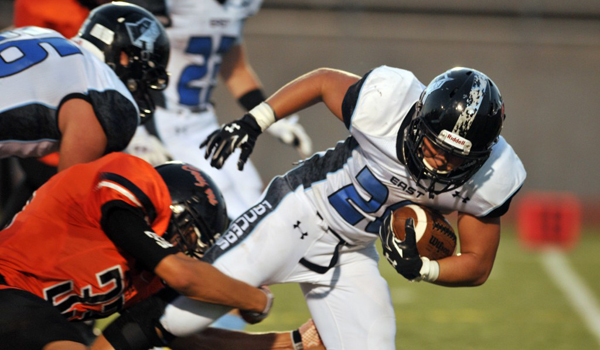 They did a great job defending it but Sam Huffman made a great cut to get in the endzone," Shawnee Mission East head coach Dustin Delaney said. "I would have done it in the first overtime if we would have had the ball second, someone had to win the game". Coming into the 2013 season the Shawnee Mission East football program didn't have a lot of success on a statewide level. The Lancers had four football playoff wins and zero state title appearance before the arrival of Delaney as their head coach last fall, dating back to when the playoff era started in 1969. So far in his first two seasons as head coach, the Lancers have six playoff wins and two state title appearances. "It's very exciting. We have a very tight knit community around Prairie Village and Leawood with very supportive people," Delaney said. "These are all local kids, all these kids grew up around here, we don't have a bunch of transfers or anything like that, it's a pretty cool deal." The Lancers will take on Hutchinson (8-4) in the state title game this Saturday in Emporia. Although a new first year head coach at Hutchinson in Ryan Cornelsen, the Satlhawks are one of the states elite programs with seven state titles since 2004, all coming under Randy Dreiling (Aquinas HC). The Salthawks have been injury plagued in 2014 and started off the 2014 season with a 2-4 record before winning their last six games. Hutchinson is 43-7 all-time in the Kansas playoffs. Hutchinson will be the underdog in this contest, just like East was against Derby last season. Nobody, but maybe themselves, had the Lancers penciled in for an appearance in the 6A title game in 2013. This year is unfamiliar territory as the Lancers have been ranked at the top of every poll most of the season. Hutchinson is led by senior Blaik Middleton, who has rushed for over 2,616 yards (36 TD) in 12 games this season. Middleton is a senior transfer who played at Dodge City High School last season. Turner Wintz and Jacob Hardenberger each have over 800 yards rushing for Hutch. "Their offense is really good especially the Middelton kid. They have a very good and physical offensive line with tough hard nosed kids," Delaney said. "They have seen our offense every day of their lives prior to this year." The reason they have seen the flex bone offense? Dreiling was the head coach at Hutchinson for 17 seasons before coming to St. Thomas Aquinas this season. Delaney was an assistant under Dreiling at Hutchinson before taking the head coaching job at Emporia High School. Delaney may have been the first to bring the flexbone to Kansas City area, but not the only one with immediate success. Dreiling has Aquinas in the 5A state title in his first year as head coach. Delaney is also no stranger to the site of the 5A state title game at Emporia State. Delaney was a linebacker for the Hornets in college and coached Emporia High School from 2009-2012. So how dangerous is the flexbone offense? Last year SM East scored over 40 on one occasion in their 13 games. In the second year under Delaney they have scored at least 40 in 10 of their 12 games. It's safe to say the offense is clicking in 2014. "We have played very well offensively. Our quarterback has done a great job of reading," Delaney said. "Year two of the offense has made a big difference for the kids understanding what they are supposed to do." The Lancers flexbone offense is led by junior running back Wyatt Edmisten, who has 1,370 yards and 29 touchdowns in 2014. Quarterback Gunnar England has passed for 1,191 yards (19 TD) and rushed for 678 yards (6 TD). The Lancers also have three other backs with at least 400 yards in Jackson Gossick (596), Calvin Jones (508), and Sam Huffman (456). Alec Dean has been England's favorite target with 513 yards and eight touchdowns. SM East has only allowed 11 points per contest in 2014, with only one team (Olathe North) scoring over 19 points. Senior defensive end Kyle Ball, a division one recruit with two FBS offers, has led the Lancer defense with 112 stops and 10 sacks in 2014. Rider Terry has 76 tackles and Jack Anderson has 74 to rank second and third on the team. Ball is one of the states best players who earned underclassmen player of the year last season from Sports in Kansas as a junior. "He's really good. He's probably the best defensive player I have ever been around," Delaney said. "His motor is non-stop, he makes plays sideline to sideline." Saturday's 6A state championship game is a 1:00 p.m. kickoff at Welch Stadium in Emporia. The Lancers will look to make history as they look to capture their first state football championship in the playoff era. Listen to the radio interview with Coach Delaney here.